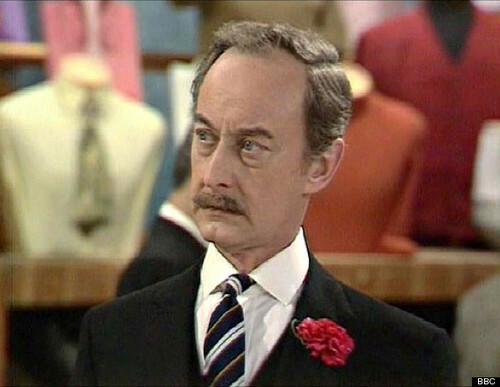 Frank Thornton, best known for his role as floorwalker Captain Peacock on the long running sticom Are You Being Served?, died 16 March 2013 at the age of 92. Frank Thornton was born Frank Thornton Ball on 15 January 1921 in Dulwich, London. He attended Alleyn's School in Dulwich, after which he attended evening classes at the London School of Dramatic Art while working as an insurance clerk by day. He eventually quit his day job and attended the Royal Academy of Dramatic Art. It was in 1940 that he made his Terence Rattigan’s French Without Tears at the Confraternity Hall at Thurles in County Tipperary in the Republic of Ireland. Afterwards he toured Ireland with various plays. After a year he returned to London where he became part of Sir Donald Wolfit’s Shakespearean company. On the West End he appeared in such productions as The Merry Wives of Windsor, Hamlet, A Midsummer Night's Dream, and Macbeth. He toured with a production of The Scarlet Pimpernel. In late 1942 he enlisted in the Royal Air Force. He trained as a navigator, but World War II ended before he could be assigned to a squadron. In 1945 he became part of the RAF Entertainment unit. He left the service in 1947. Following the war Frank Thornton appeared in a tour of The Dancing Years from 1947 to 1948. Afterwards he toured with a production of Vernon Sylvaine’s One Wild Oat. He made his television debut in 1951 in the BBC Sunday Night Theatre production of The Secret Sharer. In the Fifties he appeared on television in such programmes as The Passing Show, The Granville Melodramas, William Tell, Dixon of Dock Green, and The Men From Room 13. He was a regular on the series The Four Just Men. He made his motion picture debut in 1954 in The Silent Witness. In the Fifties he also appeared in such films as Radio Cab Murder (1954), Stock Car (1954), Johnny You're Wanted (1956), Cloak Without Dagger (1956), and Battle of the V-1 (1958). In the Sixties Frank Thornton was a regular on the TV shows HMS Paradise and The World of Beachcomber. He appeared on such shows as Danger Man, Hancock, The Avengers, The Cheaters, Hugh and I, Benny Hill, The Champions, Thicker Than Water, and The Morecambe and Wise Show. He appeared in such films as The Impersonator (1961), Victim (1961), It's Trad, Dad! (1962), Doomsday at Eleven (1963), The Wild Affair (1963), The Tomb of Ligeia (1964), Gonks Go Beat (1965), The Big Job (1965), The Murder Game (1965), Carry on Screaming! (1966), A Funny Thing Happened on the Way to the Forum (1966), Ride of the Valkyrie (1967), 30 Is a Dangerous Age, Cynthia (1968), The Assassination Bureau (1969), Crooks and Coronets (1969), The Magic Christian (1969), and The Private Life of Sherlock Holmes (1970). It was in 1972 that Frank Thornton as cast in his most famous role, the rather stuffy floorwalker at Grace Brothers department store, Captain Stephen Peacock, on Are You Being Served. The show proved to be a hit in the United Kingdom and achieved cult status in the Untied States. In the end it ran until 1985. In the Seventies Mr. Thornton also appeared on such shows as And Mother Makes Three, From a Bird's Eye View, Bachelor Father (not to be confused with the American show of he same name), Love They Neighbour, Sykes, Armchair Theatre, Steptoe and Son, Crown Court, The New Avengers, and The Goodies. He appeared in such films as The Chastity Belt (1971), Bless This House (1972), Our Miss Fred (1972), That's Your Funeral (1972), Steptoe and Son Ride Again (1973), The Three Musketeers (1973), Digby, the Biggest Dog in the World (1973), Old Drac (1975), and Are You Being Served? (1977--the film adaptation of the show). In the Eighties Frank Thornton continued his role as Captain Peacock on Are You Being Served. He was also a regular on Jane. He appeared on the shows The Gentle Touch, The Kenny Everett Television Show, The Sooty Show, and The Ronnie Corbett Show. He provided the voice of Mr. Tibbs for the animated adaptation of Roald Dahl's The BFG (1989). In the Nineties Mr. Thornton once more played Captain Peacock in the Are You Being Served? spin off Grace & Favour. In 1997 he was cast in what may be his second most famous role, that of Truly in Last of the Summer Wine. The show proved to be a hit on both sides of the Atlantic, running from 1997 to 2010. From the Nineties into the Naughts he appeared on television not only in Last of the Summer Wine, but also the 1991 BBC adaptation of Great Expectations, the 1995 adaptation of The Old Curiosity Shop, and the TV shows The Upper Hand, Causality, Doctors, and Holby City. He appeared in the films Out of the Black (2001), Gosford Park (2001), Back in Business (2007), and Run for Your Wife (2012). Although he was best known for his work in comedy, Frank Thornton was a truly versatile actor who was as gifted at playing drama as he was comedy. After all, he had begun his career as a Shakespearean actor and continued to appear in productions of the Bard's plays for decades. Of course, it is for his work in comedy that he is best known, and there is no denying that Mr. Thornton had a singular gift for the genre. Frank Thornton's brand of comedy was character driven. The humour in his roles generally did not derive from gags or situations, but from the personalities of the characters he played. To wit, he played both Captain Peacock and Truly straight--these were characters who took themselves seriously, even if others didn't always do so. What is more Frank Thornton played these characters very well. He could elicit laughs from merely arching an eyebrow. Few actors were as gifted as Frank Thornton. There can be no wonder as to why he had such success in his career.